The Smith-Lever Act providing federal funding to Cooperative Extension was signed into law on May 8, 1914 by President Wilson. On May 8, 2014, USDA, 4-H and the Extension Committee on Organization and Policy (ECOP) signed a Memorandum of Understanding guaranteeing their continued cooperation for the future. 4-H members played a major role; see inside. What if you were a 4-H’er involved in Science, Technology, Engineering and Math (STEM) projects and got to showcase your work to 700-1,000 people per hour for three days? That’s what 4-H members from four states did recently at the USA Science Education Festival in Washington, DC. In 2010 when the program began, how many people do you think knew nothing about 4-H? “Hands-on History” this month features Community Service, not a new concept for 4-H, but time to start making summer plans for your activities. There’s a story behind every one of the many calendars produced in the 50 year history of the National 4-H Calendar Program; here’s one family’s memory of the 1968 calendar. 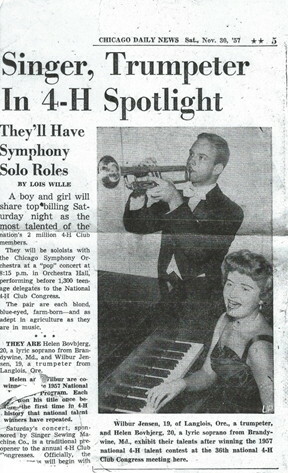 Two talented 4-H musicians, one from Maryland and one from Oregon, bring musical high notes to several National 4-H Club Congresses in the 1950s. This month, we start a short series on Helen Bvobjerg (MD) and Wilbur Jensen (OR) who performed separately and together at three Congresses each. Their story proves what we’ve always known: 4-H’ers are high-achievers in many diverse fields of endeavor.